The Esparto Regional Chamber of Commerce is dedicated to advancing the economic and social vitality of the Esparto region. Is a remarkable stretch of fertile land and rolling hills, Capay Valley is home to small and mid-size farms, natural wonders, and outstanding events. You can tour working farms, enjoy farm-to-fork dinner in the gorgeous countryside, go white-water rafting, explore nature at one of the lovely parks along the road or hike in the shapely, tree-studded hills. With a long history from Native Americans and more recent settlers, Capay Valley also has a contemporary vibe, with wine tasting, golf and festivals to make your visit even more worth-while. The lifeblood Cache Creek flows through the valley and on toward the Sacramento River, nourishing a vibrant watershed of wild animals, birds, native trees, shrubs, vines, and wildflowers. It also supports a dazzling array of livestock and poultry, fields of vegetables and flowers, grain crops, orchards, and vineyards. 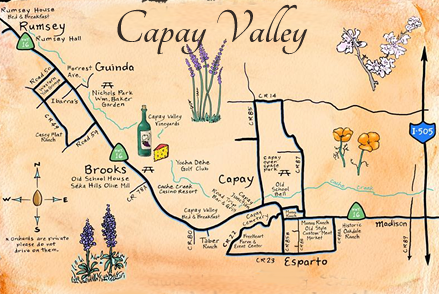 The towns that are encompassed by Capay Valley include: Madison, Esparto, Capay, Brooks, Guinda, and Rumsey. A key figure in the economy of the Esparto Region is Cache Creek Casino Resort. The people who live and work here care strongly about this land and the quality of the goods they offer. In fact, Capay Valley is a great place for entrepreneurs—nearly all the businesses here are privately owned and operated—and supported by the Esparto Regional Chamber of Commerce. For example, Capay Valley is home to more than a dozen top-flight olive oil producers, who take advantage of the Mediterranean climate to grow exquisite Italian and Spanish olive varieties. Many farm products are available for purchase through Community Support Agriculture (“CSA”) program or online at the Capay Valley Farm Shop. Whether for work or for play, Capay Valley is a destination to savor.